Hotel Trundle wedding and elopement inspiration. Wes Anderson is known for his use of color, symmetry, iconic locations, and quirky characters. This styled shoot was loosely inspired by his film, The Darjeeling Limited. For this styled shoot, I wanted to emulate one of my favorite directors and a source of inspiration while showcasing local vendors in a simplicity that felt unique and would help others in their inspiration for their weddings or elopements. 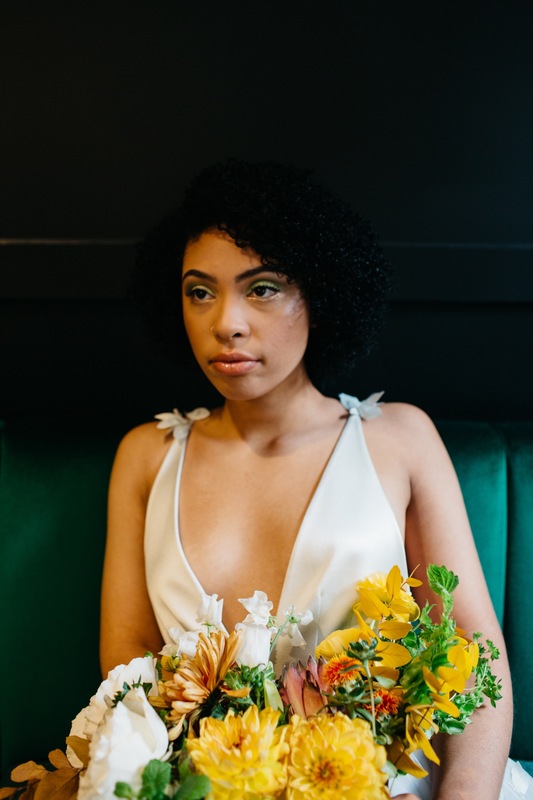 Working in collaboration with the vendors we chose a pallet of rich greens and vibrant yellows, a simple lightly sea-foam green Alexandra Grecco gown. The invitations by Iris and Marie Press are embroidered and hand letterpressed. The florals are a stunning fall pallet that perfectly complimented the space of Hotel Trundle. Hotel Trundle is a new boutique hotel in Columbia, SC located at 1224 Taylor St. They pride themselves on creating a handcrafted luxury experience for their guests in the heart of Columbia’s Historic District.